The Mask generation nodes are a selection of black-and-white mask generating-nodes. They generate a mask that is used to blend terrains and other effects together. Masks can be used as input values for nodes with optional connectors. See Working with connectors and links for more details. Mask from heights: This node creates a mask from the heights of a terrain. Mask from slopes: This node creates a mask from the slopes of a terrain. Mask from angles: This node creates a mask from the angles of a terrain. Mask from curvature: This node creates a mask from the curvature of the terrain. Mask from higher terrain: This node creates a mask by comparing two input terrains. Disk: This node creates a circular mask. Circular symmetry: This node creates a circular cone-shaped mask. 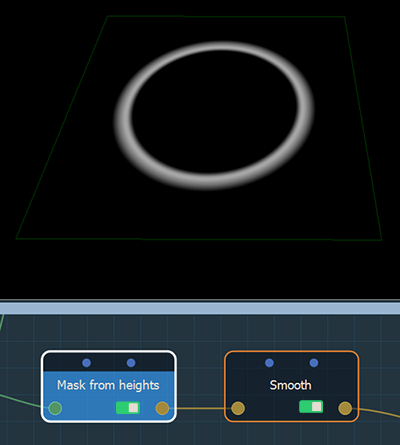 Profile curve: This node creates a mask from a curve. Painted mask: With this node, you can paint mask directly in the 3D View and immediately see the results on the terrain.